1747 ~ 1761: born in Edo. His father is the puppeteer Tatsumatsu Jûzaburô. He becomes a disciple of Matsumoto Kôshirô II, who gives him the name of Matsumoto Chômatsu, and makes his first appearance on stage in the 7th lunar month of 1753. 1st lunar month of 1762: Matsumoto Chômatsu takes the name of Matsumoto Shichizô II and start to play onnagata roles. 5th lunar month of 1764: Shichizô plays the role of Princess Kariya in the drama "Sugawara Denju Tenarai Kagami", which is staged at the Nakamuraza. 1765: Matsumoto Kôshirô II, whose wife Omatsu is the adopted daughter of Iwai Hanshirô III, supports him to get the approval of the Kabuki world to appoint his talented disciple as the heir of the Iwai clan. 11th lunar month of 1765: Matsumoto Shichizô II takes the name of Iwai Hanshirô IV at the Nakamuraza, playing the role of Lady Komachi in the drama "Kagura Uta Amagoi Komachi". His stage partners are Ichikawa Danjûrô IV, Nakamura Shichisaburô II, Ichikawa Yaozô II and Ichikawa Komazô II. 1st lunar month of 1767: Hanshirô plays in the same theater the roles of the courtesan Kewaizaka no Shôshô and Princess Sakura in the new year drama "Hatsu Akinai Ômise Soga". 7th lunar month of 1767: Hanshirô plays the role of Osato in the drama "Yoshitsune Senbon Zakura", which is performed in the same theater. His stage partner in the role of Taira no Koremori, disguised as Osato's fiance Yasuke, is Bandô Hikosaburô II. 11th lunar month of 1767: Hanshirô plays in the same theater the role of Yura Shinzaemon's daughter Tanomo in the kaomise drama "Taiheiki Shizu no Furisode". 1st lunar month of 1768: Hanshirô plays in the same theater the roles of Ume no Oyoshi and the spirit of the Taira clan in the new year drama "Fude Hajime Soga no Tamazusa". 11th lunar month of 1768: Hanshirô performs at the Moritaza in the kaomise drama "Mutsuchidori Meika no Yumitori". 2nd lunar month of 1769: the play "Sekitori Senryô Nobori", which was originally written for the puppet theater and staged for the first time in the 8th lunar month of 1767 in Ôsaka at the Takemotoza, is adapted for Kabuki for the first time, in Edo at the Moritaza; Hanshirô plays the role of Iwagawa's wife Otowa [casting]. 4th ~ 6th lunar months of 1769: Hanshirô plays the roles of Konami and Okaru in the drama "Kanadehon Chûshingura", which is staged at the Moritaza. 5th lunar month of 1769: Hanshirô plays the difficult role of Sodehagi in the third act of "Ôshû Adachi-ga-Hara", which is performed at the Moritaza. His stage partners are Sakata Sajûrô (Abe no Sadatô) and Ôtani Hiroemon III (Abe no Munetô). 9th lunar month of 1770: Chikamatsu Hanji's 1759 puppet theater drama "Hidakagawa Iriai Zakura" is staged for the first time in Edo, at the Moritaza; Hanshirô plays the role of Princess Kiyo [casting]. 1st lunar month of 1771: Hanshirô plays at the Nakamuraza the roles of the courtesan Ôiso no Tora (Jûrô's lover) and Murasakiya Ohan in the new year drama "Sakaichô Soga no Nendaiki". The role of Soga Jûrô Sukenari is played by Ichikawa Komazô II. 3rd lunar month of 1771: Hanshirô plays in the same theater the role of the courtesan Agemaki in the play "Sukeroku", staged under the title "Kongen Edo Murasaki". His partners in the roles of Sukeroku and the villain Ikyû are Ichikawa Danjûrô V and Nakamura Nakazô I. He also plays the role of the courtesan Tenmaya Ohatsu in the Miyakoji-based dance-drama "Oborozuki Tsui no Someginu", which puts in the same michiyuki the couples of lovers Tokubê/Ohatsu ("Sonezaki Shinjû"), Ochiyo/Hanbei ("Shinjû Yoi Kôshin") and Osome/Hisamatsu; the role of Ohatsu's lover Hiranoya Tokubê is played by Ichikawa Yaozô II. 4th lunar month of 1771: Hanshirô plays in the same theater the role of Hayano Kanpei in the drama "Kanadehon Chûshingura". The role of Okaru is played by Nakamura Matsue I. 7th lunar month of 1771: Hanshirô plays in the same theater the roles of Osugi and Princess Sakurako in the drama "Tamura Maro Nanae Gasane". 11th lunar month of 1771: Hanshirô plays the roles of Funawaka Gorô's wife and the pearl-diving girl Murasame in the kaomise drama "Kuni no Hana Ono no Itsumoji". His stage partners in the roles of Murasame's lover Ariwara no Yukihira and Murasame's sister Matsukaze (also in love with Yukihira) are Ichikawa Komazô II and Nakamura Nakazô I. 1st lunar month of 1772: Hanshirô plays in the same theater the role of Tsukisayo in Nakamura Jûsuke II's new year drama "Haru ha Soga Akebono Zôshi". 8th lunar month of 1772: Hanshirô plays in the same theater the role of Ohaya in the drama "Futatsu Chôchô Kuruwa Nikki". 11th lunar month of 1772: great shûmei at the Nakamuraza. The actors Matsumoto Kôshirô II, Ichikawa Komazô II and Ichikawa (or Matsumoto) Sumizô I respectively take the names of Ichikawa Ebizô III, Matsumoto Kôshirô IV and Ichikawa Komazô III. Hanshirô plays the roles of the spirit of a giant carp, disguised as the courtesan Shirotae, and Shioume Yoshigorohachi's wife in the kaomise drama "Ôyoroi Ebidô Shinozuka". The role of Shioume Yoshigorohachi is played by Matsumoto Kôshirô IV. 1st lunar month of 1773: Hanshirô plays in the same theater the roles of the courtesan Sugawara, Princess Sakura and Misajiro's wife Ohatsu in the new year drama "Wada Sakamori Eiga Kagami". The role of the priest Seigen, Princess Sakura's lover, is played by Matsumoto Kôshirô IV. 5th lunar month of 1773: Hanshirô plays in the same theater the role of the Hirato woman diver Koyumi in the drama "Dainippon Ise no Kamikaze". 8th lunar month of 1773: Hanshirô is the leading star of "Mitsu Ôgi Kumoi no Tsuki", a Nagauta program made up of seven dances with quick costum-changes: "Hanaguruma", "Hanagasa Odori" (the umbrella dance), "Kairaishi" (the puppeteer), "Miko" (a maiden in the service of a shrine), "Musume Odori" (the daughter dance), "Kiri Kamuro" (the attendant of a high-ranking courtesan) and "Neko" (the cat). 9th lunar month of 1773: Hanshirô plays in the same theater the roles of Tonami and Yae in the drama "Sugawara Denju Tenarai Kagami". The roles of Genzô (Tonami's husband) and Sakuramaru (Yae's husband) are played by Ichikawa Yaozô II and Ichikawa Monnosuke II. 11th lunar month of 1773: premiere at the Nakamuraza of the play "Gohiiki Kanjinchô", performed as a kaomise drama. Hanshirô plays the roles of Princess Shinobu and Motoyoshi Shirô's wife [casting]. This 46-days long performance, which is also the shûmei of Nakamura Rikô I, is a tremendous success. 1st lunar month of 1774: Hanshirô plays in the same theater the roles of Tametomo's daughter Chidori no Mae and Kisegawa no Kametsuru in the new year drama "Oatsuraezome Soga Hinagata". The role of Minamoto no Tametomo is played by Ichikawa Ebizô III. 3rd lunar month of 1774: Hanshirô and Matsumoto Kôshirô IV perform together the roles of Onatsu and Seijûrô in the same theater in the michiyuki "Nushiyatare Koi no Yamabuki". 5th lunar month of 1774: big crisis at the Nakamuraza; several high-ranking actors, including Hanshirô, Ichikawa Ebizô III, Ichikawa Danjûrô V and Matsumoto Kôshirô IV leave the theater. 11th lunar month of 1774: Hanshirô joins the Moritaza and plays the roles of Shizuka Gozen and Ogata's wife in the kaomise drama "Ichi no Tomi Tsuki no Kaomise", which welcomes in Edo the Kamigata actor Nakamura Shingorô II; the roles of Minamoto Yoshitsune and Satô Tadanobu are played by Bandô Mitsugorô I and Matsumoto Kôshirô IV. 1st lunar month of 1775: Hanshirô plays in the same theater the roles of Senju no Mae and the courtesan Usugumo in the new year program "Shida Yuzuriha Hôrai Soga". 5th lunar month of 1775: Hanshirô plays in the same theater the roles of Sakuramaru, Tonami and Haru in the drama "Sugawara Denju Tenarai Kagami". 8th lunar month of 1775: Hanshirô plays in the same theater the roles of Izumo no Okuni and Yamana Sanza's sister Fumizuki in the drama "Keisei Tsuki no Miyako". 9th lunar month of 1775: Hanshirô plays in the same theater the role of the pearl-diving lady Murasame in the Tokiwazu-based dance-drama "Oki Miyage Inaba no Yamamatsu". His stage partners in the roles of Murasame's lover Ariwara no Yukihira and Murasame's sister Matsukaze (also in love with Yukihira) are Matsumoto Kôshirô IV and Nakamura Noshio I. 11th lunar month of 1775: Hanshirô moves to the Ichimuraza and plays in the kaomise program "Oyafune Taiheiki". 3rd lunar month of 1776: Hanshirô plays in the same theater the role of the courtesan Agemaki in the play "Sukeroku Yukari no Hatsuzakura". His stage partner in the role of Sukeroku is Ichikawa Yaozô II (replaced because of illness by Ichimura Uzaemon IX). The performance is a huge success and extended up to the 6th lunar month. 7th lunar month of 1776: Hanshirô plays the roles of Yae and Midai Umezono no Gozen in the drama "Sugawara Denju Tenarai Kagami", which is staged in the same theater. 11th lunar month of 1776: Hanshirô moves to the Moritaza and plays in the kaomise program "Hikitsurete Yagoe Taiheiki". His yearly salary is 500 ryô. 1st lunar month of 1777: Hanshirô plays in the new year program "Edo Jitate Kosode Soga", which is produced in the same theater. 4th lunar month of 1777: Hanshirô plays the roles of Gonta's wife Kosen and Shizuka Gozen in the drama "Yoshitsune Senbon Zakura", which is performed in the same theater. 7th lunar month of 1777: Hanshirô plays in the same theater the roles of Itoya Oito and Sagami Jirô's sister Oyuki in the drama "Hônô Nitta Daimyôjin". 11th lunar month of 1777: Hanshirô moves to the Nakamuraza and plays the roles of Sanuki no Mae and the courtesan Onomichi in the kaomise program "Masakado Kanmuri no Hatsuyuki". His stage partners are Ichikawa Danjûrô V, Matsumoto Kôshirô IV, Ichikawa Monnosuke II, Yoshizawa Sakinosuke III and Bandô Mitsugorô I. 5th lunar month of 1778: Hanshirô plays in the same theater the role of Yaoya Oshichi in the drama "Yaoya Oshichi Koi no Edozome". 7th lunar month of 1778: premiere at the Nakamuraza of the play "Date Kurabe Okuni Kabuki". Hanshirô plays the roles of Takao's sister Kasane, Narutaki and Kasaya Sankatsu [casting]. 11th lunar month of 1778: Hanshirô plays at the Nakamuraza 2 roles in the kaomise drama "Motomishi Yuki Sakae Hachinoki", which celebrates the shûmei of Yoshizawa Ayame IV and the first stage appearance of Bandô Mitahachi I. 3rd lunar month of 1779: Hanshirô plays in the same theater the role of the courtesan Agemaki in the play "Sukeroku Sato no Yozakura"; the roles of Sukeroku, Shinbê and the villain Ikyû are played by Ichikawa Monnosuke II, Matsumoto Kôshirô IV and Ôtani Hiroemon III. 11th lunar month of 1779: Hanshirô plays in the same theater the roles of Kôtô-no-Naishi and a countryside maiden in the kaomise drama "Kaeribana Eiyû Taiheiki", which celebrated the shûmei of Yamashita Mangiku I. 1st lunar month of 1780: Hanshirô plays in the same theater the role of Fuji Minbu's sister in the new year program "Hatsumonbi Kuruwa Soga". Tthe role of Fuji Minbu is played by Bandô Mitsugorô I. 2nd lunar month of 1780: Hanshirô plays in the same theater the role of Shinobu in "Gonin Otoko", the second part (nibanme) of the new year program "Hatsumonbi Kuruwa Soga". 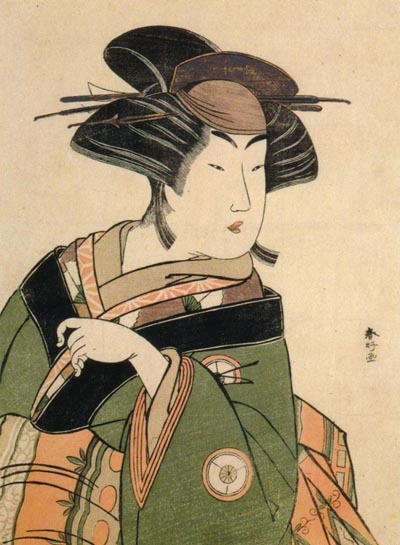 The role of Shinobu's elder sister, the courtesan Miyagino, is played by Yamashita Kinsaku II. 9th lunar month of 1780: Hanshirô plays in the same theater the role of Okaru in the drama "Kanadehon Chûshingura". The role of Hayano Kanpei is played by Ichikawa Monnosuke II. The Nakamuraza welcomed Onoe Kikugorô I, who left the Ichimuraza because of some management troubles in the 5th lunar month. This is his last performance in Edo before going back to Ôsaka. 11th lunar month of 1780: Hanshirô performs in the same theater in the kaomise program "Kite Kaeru Nishiki no Wakayaka". 5th lunar month of 1781: Hanshirô plays in the same theater the roles of Narihira and Shigenoi in the dramas "Yamatogana Ariwara Keizu" and "Koi Nyôbô Somewake Tazuna". 9th lunar month of 1781: Hanshirô performs in the same theater in the company of Nakamura Nakazô I in "Iromi Kusa Yotsu no Somewake", a memorial performance for the 22nd anniversary of the passing away of Iwai Hanshirô III. 11th lunar month of 1781: Hanshirô moves to the Ichimuraza and plays in the kaomise program "Mukashi Otoko Yuki no Hinagata". 5th lunar month of 1782: Hanshirô plays the role of the courtesan Agemaki in the play "Sukeroku Yukari no Edo Zakura", which is performed in the same theater. His partner in the role of Sukeroku is Ichimura Uzaemon IX. 11th lunar month of 1782: Hanshirô moves to the Nakamuraza and plays in the kaomise program "Godai Genji Mitsugi no Furisode". His stage partners are Ichikawa Danjûrô V, Sawamura Sôjûrô III, Segawa Kikunojô III, Ichikawa Danzô IV and Onoe Matsusuke I. 1st lunar month of 1783: Hanshirô's rank in the Edo hyôbanki, wakaonnagata section, is jô-jô-kichi (superior - superior - excellent). He plays in the same theater the role of Princess Sakura in the new year drama "Edo no Hana Mimasu Soga". The role of the priest Seigen is played by Sawamura Sôjûrô III. 3rd lunar month of 1783: Hanshirô plays in the same theater the roles of Oshun, Hitomaru and Sonoo-no-Mae in the drama "Hanakawado Migawari no Dan". 5th lunar month of 1783: Hanshirô plays in the same theater the roles of Kaoyo Gozen, Osono and Oishi in the drama "Kanadehon Chûshingura". 8th lunar month of 1783: Hanshirô plays in the same theater the roles of Oteru and Oseki in the drama "Futatsu Chôchô Kuruwa Nikki". 9th lunar month of 1783: Hanshirô plays in the same theater the roles of Ohide and Osei in the drama "Buke no Hana Musume no Adauchi". 11th lunar month of 1783: the Nakamuraza is damaged in a fire and Hanshirô moves temporarily to the Moritaza in order to play in the kaomise program "Ono no Terusaki Yuki no Akebono". 1st lunar month of 1784: Hanshirô is back at the Nakamuraza and plays in the new year program kaomise "Fude Hajime Kanjinchô". 6th lunar month of 1784: Hanshirô plays in the same theater the roles of Gonta's wife Kosen and Osato in the drama "Yoshitsune Senbon Zakura". 8th lunar month of 1784: Hanshirô plays in the same theater the role of Koharu in Chikamatsu Monzaemon masterpiece's "Shinjû Ten no Amijima". The role of Kamiya Jihê is played by Sawamura Sôjûrô III [print]. From the 17th of this month, he plays the roles of Tonase and Okaru in the drama "Kanadehon Chûshingura". 9th lunar month of 1784: last performance in Edo for Hanshirô, who is about to go to Ôsaka. He plays in the same theater the great role of Kuzu-no-Ha in the drama "Ashiya Dôman Ôuchi Kagami". Fall 1784: Hanshirô and Matsumoto Kôshirô IV go together to Ôsaka. 11th lunar month of 1784: Hanshirô plays in the kaomise drama "Naka ni Môketa Otogo Kaomise", which is produced by Nakamura Kumetarô II at the Naka no Shibai. 1st lunar month of 1785: his rank in the Ôsaka hyôbanki, wakaonnagata section, is jô-jô-kichi (superior - superior - excellent). 5th lunar month of 1785: first Kabuki adaptation of Chikamatsu Hanji's puppet theater drama "Shinpan Utazaimon", which is staged at the Naka no Shibai; Hanshirô plays the role of Omitsu [casting]. Summer 1785: tour in Akashi. Hanshirô plays the role of Shizuka Gozen in "Yoshitsune Senbon Zakura". 11th lunar month of 1785: Hanshirô plays the role of Osato in the drama "Yoshitsune Senbon Zakura", which is produced by Onoe Ushinosuke in Ôsaka at the Kado no Shibai. 8th lunar month of 1786: Hanshirô plays the roles of Okiji and Omiwa in the drama "Imoseyama Onna Teikin", which is produced by Nakamura Noshio II in Ôsaka at the Nishi no Shibai. 11th lunar month of 1786: Hanshirô is back in Edo and plays at the Kiriza in the kaomise program "Mutsu no Hana Izu no Hataage" [print]. 1st lunar month of 1787: Hanshirô plays in the same theater the role of Tsukisayo in the new year drama "Yuki Nazuna Saiwai Soga". 3rd lunar month of 1787: Hanshirô plays in the same theater the roles of Yume no Kochô ("the dream butterfly") and Kitsunegasaki no Otama ("Otama from the fox peninsula") in the drama "Miyakodori Yayoi no Watashi". Hanshirô, Ichikawa Danjûrô V and Ichikawa Monnosuke II perform together in the Tokiwazu-based dance "Hana ni Kitsu Negura no Irodori". 4th lunar month of 1787: Hanshirô plays in the same theater the role of the courtesan Hatsuito in the second part (nibanme) of the new program "Miyakodori Yayoi no Watashi". 4th ~ 5th lunar months of 1787: Hanshirô performs in the same theater in an amazing seven roles Nagauta-based dance called "Nanae Ginu Azuma Hinagata". The seven sections are "Kanjo" (the court lady), "Harukoma" (a dance using a horse head look-alike puppet), "Keisei" (a high-ranking courtesan), "Zatô" (the blind masseur), "Rôjo" (the senior lady-in-waiting), "Kusakari" (the grass mower) and "Shakkyô" (the lion spirit at the stone bridge) [Print]. 5th lunar month of 1787: Hanshirô plays in the same theater the role of Shigenoi in the drama "Koi Nyôbô Somewake Tazuna". 8th lunar month of 1787: Hanshirô plays in the same theater the roles of Tonase, Osono and Okaru in the drama "Kanadehon Chûshingura". 9th lunar month of 1787: Hanshirô plays in the same theater the roles of Hanbei's wife Osai, Osai's daughter Osono and Chôsaku's wife Oiwa in the drama "Tenjiku Tokubê Kokyô no Torikaji". He also performs, with Ichikawa Komazô III, Ichikawa Monnosuke II and Yamashita Mangiku I, at the end of the program in the Tokiwazu-based dance "Iromi Gusa Honni Yoi Naka". 11th lunar month of 1787: second kaomise at the Kiriza for Hanshirô who plays the roles of Sonô, Sonome and Yaehata [print] in the drama "Sanga no Shô Mutsu no Hanayome". 1st lunar month of 1788: Hanshirô plays in the same theater the roles of the courtesan Kewaizaka no Shôshô, Hisamatsu and Oume in the new year program "Keisei Natori Soga"; the roles of Soga Gorô (Shôshô's lover) and Osome (Hisamatsu's lover) are played by Ichikawa Komazô III and Segawa Kikunojô III. 7th lunar month of 1788: Hanshirô plays in the same theater the roles of Kan Shôjô and Yae in the drama "Sugawara Denju Tenarai Kagami". 8th ~ 9th lunar months of 1788: last program for the Kiriza, which has to give back its license to the Ichimuraza and close its business. Hanshirô plays the main role in the drama "Rangiku Makura Jidô". 11th lunar month of 1788: Hanshirô joins the Ichimuraza and performs in the kaomise drama "Genji Saikô Kogane no Tachibana", which celebrates the arrival in Edo of the Kamigata actor Asao Tamejûrô I. 1st lunar month of 1789: his rank in the Edo hyôbanki, wakaonnagata section, is goku-jô-jô-kichi (extreme - superior - superior - excellent). He plays in the same theater the roles of Okuni and Soga Gorô in the new year drama "Koi no Yosuga Kanagaki Soga". 3rd lunar month of 1789: Hanshirô plays in the same theater the role of the courtesan Ôyodo in the second part (nibanme) of the new year program "Koi no Yosuga Kanagaki Soga". 4th lunar month of 1789: Hanshirô plays in the same theater the role Kameya Chûbê's wife Osuwa in the drama "Koi no Hikyaku". 5th lunar month of 1789: Hanshirô plays in the same theater the roles of Shindô Genpachi's wife Mifune and Okumi in the drama "Sanjukkoku Yobune no Hajimari". The role of Shindô Genpachi is played by Sawamura Sôjûrô III. 6th lunar month of 1789: Hanshirô plays in the same theater the roles of Jûtarô's wife, Heiemon's wife and Kudayû's widow in the drama "Taiheiki Chûshin Kôshaku". 11th lunar month of 1789: Hanshirô performs in the Ichimuraza kaomise program "Hana no Oedo Masakado Matsuri". 1st lunar month of 1790: Hanshirô plays in the same theater the roles of a young geisha, Princess Yamasaki and Hangaku in the new year drama "Ureshiku Zonji Soga". 2nd lunar month of 1790: Hanshirô plays the role of Princess Taema in the great play "Narukami Fudô Kitayama Zakura", which is performed in the same theater. His partner in the role of the wicked priest Narukami is Ichikawa Danjûrô V.
3rd lunar month of 1790: Hanshirô, Ichikawa Danjûrô V, Sawamura Sôjûrô III and Ôtani Hiroji III perform together in the Tokiwazu-based dance-drama "Tao Yanagi Oboro no Kurokami". 4th lunar month of 1790: Hanshirô plays in the same theater the role of Ochiyo in the love drama "Ochiyo Hanbei". His partner in the role of Hanbei is Sawamura Sôjûrô III. 11th lunar month of 1790: Hanshirô moves to the Nakamuraza and plays in the kaomise program "Sayo no Nakayama Hiiki no Tsurigane", which welcomes back in Edo the actor Ichikawa Yaozô III and welcomes the Kamigata actors Tanimura Torazô and Nakamura Kumetarô II. 1st lunar month of 1791: premiere at the Nakamuraza of the Nagauta-based dance "Taimen Hana no Harukoma", which is performed at the end of the new year program "Haru no Sekai Nigiwai Soga"; Hanshirô plays the role of a courtesan [casting]. 3rd lunar month of 1791: Hanshirô plays the role of the courtesan Agemaki in the play "Sukeroku Yukari no Botan", which is performed at the Nakamuraza. His partner in the role of Sukeroku is Ichikawa Yaozô III. This play is the second part of the program "Haru Sekai Nigiwai Soga", a memorial performance for the 32nd anniversary of the death of Ichikawa Yaozô I. 5th lunar month of 1791: Hanshirô plays in the same theater the role of Enju's sister Ofuku in the drama "Hirakana Seisuiki". 8th lunar month of 1791: Hanshirô plays in the same theater the role of Ise no Naishi in the drama "Kiku no En Mukashi no Kyô". 11th lunar month of 1791: Hanshirô moves to the Kawarasakiza and plays in the kaomise program "Mieikô Nori no Hachinoki". He plays the main role of the "Onna Shibaraku" part ("Lady wait for a moment", a parody of the bombastic play "Shibaraku"): "Hanshirô IV made the normal entry down the walkway through the audience (hanamichi), wearing the "Shibaraku" costume decorated with the large square crests of the Ichikawa family. Just as he was about to accost evil Prince Munetaka on the main stage, his fellow actor Osagawa Tsuneyo II climbed up from the front row of the audience and interrupted, calling out, "Aren't you my younger sister Onaka?" Piece by piece, the "Shibaraku" costume was removed and the makeup was washed off, to reveal a precocious young girl wearing a long hanging-sleeved kimono (furisode) beneath! This unexpected development in the hackneyed "Shibaraku" was well received" (from "The Actor's Image"). 3rd lunar month of 1792: Hanshirô plays in the same theater the role of Yaegushi no Oroku in the drama "Keisei Kogane no Hakarime". 4th lunar month of 1792: Hanshirô performs in the same theater in an amazing seven roles dance called "Kakitsubata Nanae no Someginu". The seven sections are "Komachi" (the name of a famous poetess), "Tenaraiko" (the learning girl), "Zatô" (the blind masseur), "Urashima" (based on the legendary character Urashima Tarô), "Kiri Kamuro" (a young girl attendant for a high-ranking courtesan), "Shiokumi" (the salt-making girl) and "Shakkyô" (the lion spirit at the stone bridge). 5th lunar month of 1792: Hanshirô plays the roles of Hayano Kanpei, Kaoyo Gozen and Oribe in the drama "Chûshin Denshikata Kôshaku", a play whose plot and characters belong to the "Kanadehon Chûshingura" world. 8th lunar month of 1792: Hanshirô plays in the same theater the role of Kuzu-no-Ha in the play "Ashiya Dôman Ôuchi Kagami", a memorial performance for the 6th anniversary of the death of Nakamura Tomijûrô I, which is staged in the same theater. 11th lunar month of 1792: Hanshirô participates at the Kawarasakiza in the kaomise program "Ôfuna Moriebi no Kaomise". 1st lunar month of 1793: Hanshirô plays in the same theater the roles of Ohatsu, Tsukisayo and Shirai Gonpachi in the new year drama "Gozen Gakari Sumô Soga". The roles of Onoe (Ohatsu's mistress) and Iwafuji (Ohatsu's enemy) are played by Osagawa Tsuneyo II and Ichikawa Ebizô. The role of Banzui Chôbê, friend of Shirai Gonpachi, is played by Ichikawa Ebizô. This performance, which features the first large scale tachimawari in Kabuki history, is a tremendous success. This is also the first time that the role of Shirai Gonpachi is portrayed by Hanshirô. 5th lunar month of 1793: Hanshirô plays in the same theater the role of Yaoya Oshichi in the drama "Junshokun Yaoya Oshichi". The actors Ichikawa Ebizô, Osagawa Tsuneyo II, Ichikawa Omezô I, Iwai Kiyotarô II and Hanshirô perform together in the Tokiwazu-based dance "Hototogisu Yumeji no Koi". Hanshirô also plays the role of Shirai Gonpachi in the "Suzu-ga-Mori" scene. His stage partner in the role of Banzuiin Chôbê is Ichikawa Ebizô. The performance is a huge success and Hanshirô decides to finance the rebuilding of the grave of the real Yaoya Oshichi. 8th lunar month of 1793: Hanshirô plays in the same theater the roles of Oyasu and Tsuru no Mae in the drama "Hime Komatsu Ne no Bi no Asobi". 11th lunar month of 1793: Hanshirô takes part in the Kawarasakiza kaomise program "Nigiwai Genji Hana Saku Mon". 1st lunar month of 1794: Hanshirô plays in the same theater the roles of Kagekiyo's wife Akoya, Kagekiyo's enemy Chichibu no Shôji Shigetada and Tsukisayo in the new year drama "Gohiiki no Hana Aikyô Soga". The role of Taira no Kagekiyo is played by Ichikawa Ebizô. 5th lunar month of 1794: Hanshirô plays in the same theater the role of Shigenoi in the drama "Koi Nyôbô Somewake Tazuna". He also plays the roles of Tadanobu and the fox Genkurô in the drama "Yoshitsune Senbon Zakura". His stage partner in the role of Shizuka Gozen is Osagawa Tsuneyo II. 7th lunar month of 1794: Hanshirô plays in the same theater the roles of Ohan and Katsumoto's sister Ichô-no-Mae in the drama "Nihon Matsu Michinoku Sodachi", whose plot and characters belong to the "Meiboku Sendai Hagi" world. 9th lunar month of 1794: Hanshirô plays in the same theater the roles of Hayano Kanpei, Kaoyo Gozen and Oishi in the drama "Kanadehon Chûshingura". 10th lunar month of 1794: due to some financial difficulties, the salaries of all the actors are drastically reduced. Hanshirô's yearly salary for the coming season is set to 900 ryô after a reduction of 400 ryô. 11th lunar month of 1794: Hanshirô participates at the Kawarasakiza in the kaomise program "Matsu ha Misao Onna Kusunoki". His official yearly salary is 900 ryô. 5th lunar month of 1795: Hanshirô plays the role of Okaru in the drama "Kanadehon Chûshingura", which is staged in the same theater. 9th lunar month of 1795: Hanshirô plays the roles of Sadaka and Omiwa in the drama "Imoseyama Onna Teikin", which is staged in the same theater. His stage partners are Matsumoto Kôshirô IV (Daihanji no Kiyosumi, Kamatari), Onoe Matsusuke I (Fukashichi), Iwai Kiyotarô II (Koganosuke, Princess Tachibana) and Matsumoto Komazô III (Motome). 11th lunar month of 1795: Hanshirô performs in the same theater in the kaomise program "Fuku Botan Azuma Dairi". 1st lunar month of 1796: second stay in Kamigata. Hanshirô plays in the dramas "Iwai Irimasu Haru no Kaomise" and "Zôho Usuyuki Monogatari", which are produced by Nakayama Ittoku I at the Naka no Shibai in Ôsaka. He also achieves a great success in a 7 roles dance called "Nanaeginu Azuma Hinagata". 5th lunar month of 1796: Hanshirô tours in Miyajima in the company of Ichikawa Danzô IV. 11th lunar month of 1796: Hanshirô is back in Edo and performs at the Miyakoza in the kaomise program "Seiwa Nidai Ôyose Genji", which celebrates also the isse ichidai performance of Ichikawa Ebizô and the shûmei of Ichikawa Ebizô V.
1st lunar month of 1797: Hanshirô plays in the same theater 7 roles in the new year program "Edo no Haru Kichirei Soga". 5th lunar month of 1797: Hanshirô plays in the same theater the roles of Enju and Ofude in the drama "Hirakana Seisuiki". 8th lunar month of 1797: Hanshirô plays in the same theater the role of Wadahei's wife in the drama "Ômi Genji Senjin Yakata". 11th lunar month of 1797: the Miyakoza has to give back its license to the Nakamuraza and Hanshirô moves there to participate in the kaomise program "Kaikei Kokyô no Nishikigi". 3rd lunar month of 1798: Hanshirô plays the role of Kamatari's wife, lady Mikasa Gozen, in the drama "Imoseyama Onna Teikin", which is staged at the Nakamuraza. 2nd lunar month of 1799: Hanshirô plays in the same theater the role of Masaoka in the drama "Ômiura Date no Nebiki", whose plot and characters belong to the "Meiboku Sendai Hagi" world. 1st lunar month of 1800: Hanshirô appears on stage for the last time, playing in the drama "Fuji o Mimasu Saiwai Soga", which is performed at the Nakamuraza. Iwai hanshirô IV was an amazing onnagata actor who found fame during the second half of the seventeenth century. His rival for the title of best Edo onnagata was the star Segawa Kikunojô III. He was a very meticulous actor in the preparation of his roles. It is said that Hanshirô went to visit a bordello, the Maruya house in the district of Mita in Edo, in order to study carefully the life of a famous and beautiful prostitute called Osen. Then, Hanshirô modeled all his courtesan roles on Osen. The origin of his guild name is interesting: some may think that Yamatoya is associated with the province of Yamato (northern part of the current Nara Prefecture), which is the case for others lines of actors using the same yagô because the founder of the line was born there, but it is not right in the case of Iwai hanshirô IV. His fans used to shout "Yama Yama", an original way to appraise their star, meaning that Hanshirô was a very talented oyama. Yamatoya has its origins in these "Yama, Yama" shoutings.